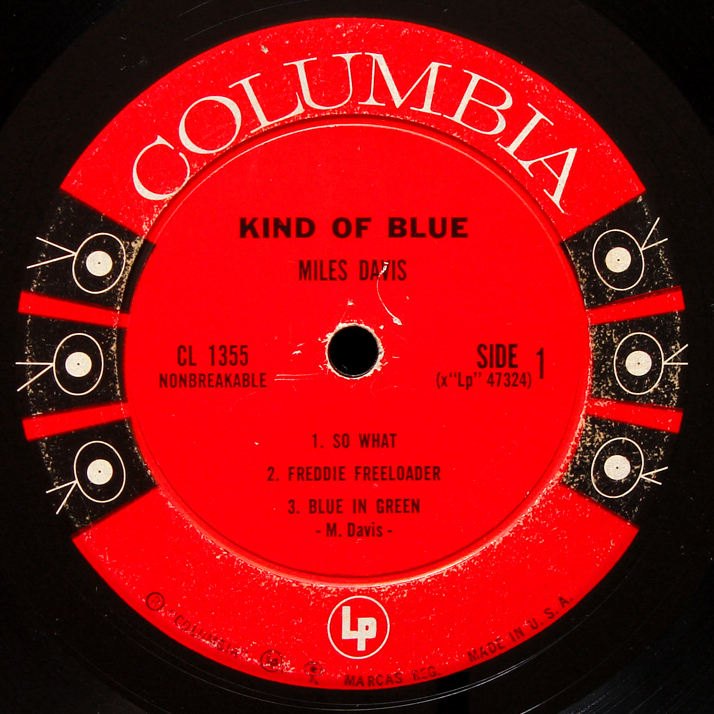 There is a record which is perfect to test the theory of Columbia matrixes to see how well it explains and dates the manufacture of Columbia records in practice – the immortal Kind of Blue. Lots of matrix information has been collected by record sellers and many thousands of early pressings have been auctioned. First, a recap on conventional wisdom information. Kevin Gray: “Columbia used PAL and PBL prefixes for side 1 and 2, and A and B suffixes for the Santa Maria, Ca. plant, C and D for Terra Haute, In. and E and F for Pitman N.J. Six (or more) sets of lacquers were usually cut for any big-name artist, so the very first mastering would be 1A,1B,1C,1D,1E,and1F. Any recuts would be the next higher number for that plant”. 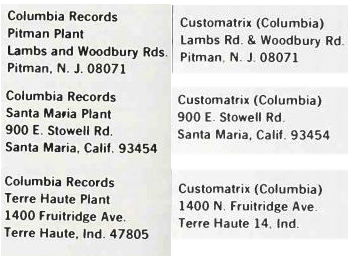 Columbia owned several different vinyl pressing plants over the years, consolidating operations and closing older facilites from time to time. At one point, in the early mid ’60s, five plants were in simultaneous operation, which possibly helps explain why multiple laquers were being cut – to support pressing at many different locations. The oldest Columbia plant was at Bridgeport, Conn. founded in the 1920’s and closed in March 1964. Much of its equipment was transferred to Columbia’s Pitman NJ plant, which became fully operational in May 1961 until vinyl production ceased around 1987. The second oldest Columbia plant was at Terre Haute IN, operating from 1953 to around 1982. On the west coast, vinyl was pressed at Hollywood CA (Alden Drive) from 1948 to 1964, which was then consolidated and transferred to the newer Santa Monica CA plant, operating between late 1963 to 1981. Key Time Point: in August 1959, the month KoB was released, Columbia had three plants of its own in operation: Bridgeport CT, Terre Haute IN, and Hollywood CA. Key Time Point: in the period between 1958 and 1963,in which the Columbia Six-Eye label was in use, four Columbia plants were in operation: Bridgeport, Pitman, Terre Haute and Hollywood. Any six-eye label KoB pressing could have been pressed at any one of those four plants. The Customatrix division of Columbia Records was responsible for metal parts, the production of mothers and stampers, and were probably the custodians of lacquers. Seen above, they had a facility co-located with each Columbia pressing plant. They may eventually have arrived at a neat and orderly system of lacquer distribution with this combination of plants, but the evidence from Kind of Blue shows that was not how the system worked in 1959. 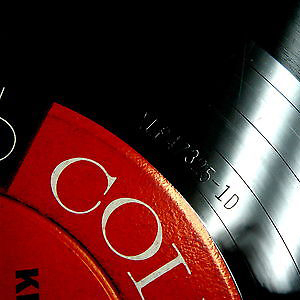 “When first released in 1959, Columbia had three pressing plants, only it was a different itinerary from after 1963: Bridgeport, CT; Terre Haute, IN; and Hollywood, CA. Mono and stereo promos were pressed in Bridgeport, and the label fonts were the exact same as would later be used by Pitman. Canadian pressings, from 1954 through 1971, were pressed by Quality Records Ltd. for Columbia Records Of Canada Ltd. I can verify that when sets of lacquers were cut for an album or a single, at least one set was shipped to Canada. All lacquers cut are numbered in a uniform matrix code format, stamped into the runout area area of the lacquer, between the grooves and label. What Conventional Wisdom does not explain is asymmetrical pairing. Since a lacquer pair includes Side 1 and Side 2 of the record, the lacquer code can in theory appear simultaneously on both sides (1A/1A) , but if two lacquers were supplied to one location, four permutations are possible:1A/1A, or 1A/1B or 1B/1A or 1B/1B. Many Columbia pressings have asymmetrical non-sequential pairings, such as 1D/1AC. If they were random pairings, we would see sometimes symmetrical pairs simply by chance, but we don’t. There was something in the selection that deliberately chose offset pairs. The process-control system to keep track of lacquers, mothers and stampers did not require matching or sequencing, because it did not matter which source was used – as long as you had a Side 1 and a Side 2 stamper mounted in the press. Having two or more lacquer sources, it is surprising mistakes were not made pressing a record with two Side 1’s from side 1 stampers from separate lacquers but this never seems to have occurred, so there is probably some other form of process control which we don’t know about. Press operators at this time have stressed that their two priorities were to ensure Side 1 and 2 were matched, and that the labels were completely dry. To understand how Columbia matrix codes worked in practice, over 1,000 individual Ebay auctions of Kind of Blue were examined going back over the last three years. Total number of KoB copies auctioned in that period was over 3,000. KoB is many things, but “rare!” it is not. The search criteria concentrated on finding the promos and early pressings. Many sellers omitted mention of matrix codes completely, or identified only one side, on the assumption the other side would be the same (they are usually not). Two hundred fifty auction copies with good stamper information and photos of both labels were found: 200 mono, 50 stereo, reflecting the slow early uptake of new stereo phonograms. Kind of Blue was recorded in both mono and three track stereo at Columbia’s 30th St Studios. In preparation for the commercial release, Columbia engineers cut at least 27 identical lacquers from the first master tape mix, one set mono, the other stereo. All lacquers were cut at the same time, and were put into use in a semi-chronological order over the following two to three decades, by different plants. In no special order, a handful of lacquers were selected to press white label promotional copies for distribution to reviewers and disk jockeys – mono (red text label) and stereo (black text label), with the text DEMONSTRATION, and NOT FOR SALE on the label. The promos were most likely both pressed at Columbia’s Bridgeport Connecticut plant (according to W.B.’s update) given the consistent label print and type-setting on the two versions. The artist name and album title are set in Erbar Light Condensed font, used by Bridgeport and which went on to be used in label printing for Pitman. You will see other fonts used by printers for other plant locations. Whilst metal was strictly process controlled, it seems there was much greater latitude in printing, with different fonts and discretionary compositing decisions e.g. Kind of Blue on one lines or two, in a variety of different fonts. Fortuitously, an error was made in the track listing of the Side 2 label. Flamenco Sketches was wrongly listed as the first track, and All Blues as the second. All promos (and very early commercial pressings) have the Side 2 track-listing error. This was corrected (ie order reversed) on the label of commercial release pressings, at the instruction of Teo Macero, around November 1959. Hence promos are all proven pre 11/59. The track sequence error remained on the jacket in perpetuity. 1D/1H, 1H/1D, 1D/1G, 1G/1D, no other letters or variations were made mention of, no symmetrical pairs found (eg 1G/1G). The four variations are offset pairs eg 1D/1H and 1H/1D. The only unique letters found are D, G and H, and each letter is found as Side 1 and Side 2. D is found in every permutation, G and H are never found paired with each other, or at least not found in my sample. The above example on loan from a friend has 1D/ 1G stamper matrices, the Side 2 label track sequence error, but more interesting are the T/ TA stamps on the opposite side of the deadwax. Bridgeport mother/stamper process control process? A few other sharp-eyed KOB sellers noted T stamps – a TA/ TB permutation, and a TB/ TC permutation. 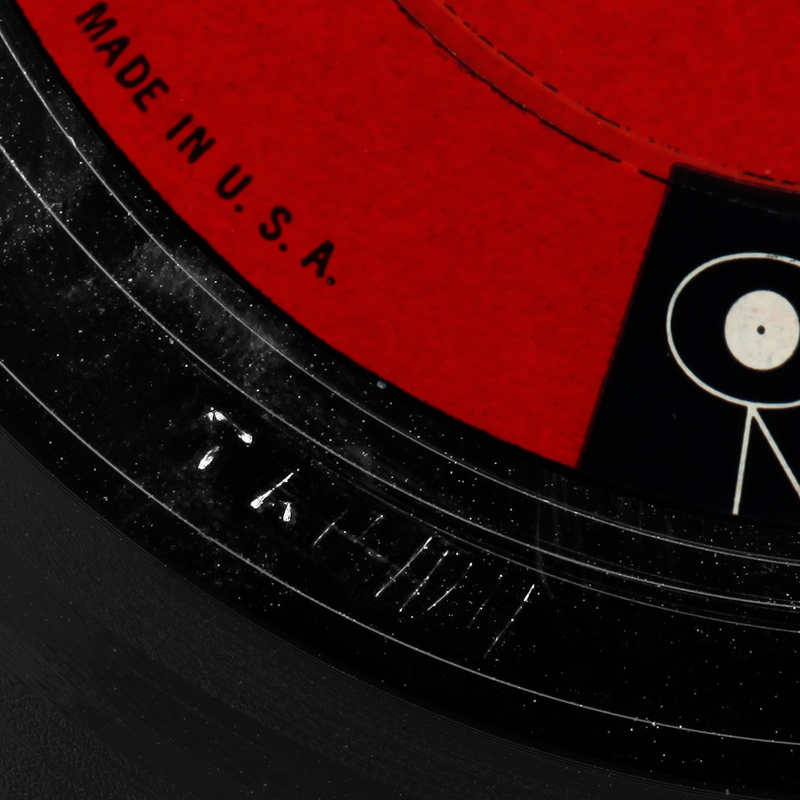 Though T has been suggested as referring to Terre Haute, it remains likely a Bridgeport pressing suggested by the label fonts. Most but not all lacquers used to press promos went on to be used to press the commercial release. Stereo promos replicate the early track sequence error seen on the mono promo labels i.e. they too are pre 11/59. Similar to mono, stereo promos were found in four combinations of offset letter pairs, unique letters are E, K, AC and AE; each found as side 1 and side 2, but never mixed eg there is no 1E/1AC or 1K/AE. No other letters were found. Stereo promos leapfrog the expected alphabetic progression jumping from E (5th cutting) to AE (16th cutting). Stereo promos were produced from four lacquers: E, K, AC and AE. They occur in similar offset mirrored pairs: E/K, K/E, AC/AE, AE/AC. 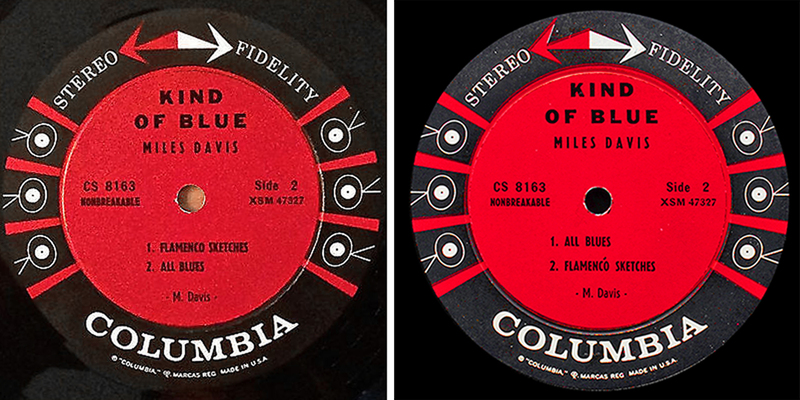 Lacquers used to press Kind of Blue stereo promos continued in use, except E, which joined the list of lacquers which were never used. A small number of lacquers were responsible for generating promos, manufactured in one plant, thought to be Bridgeport Conn.
All KoB promos are pre 11/59 (have Side 2 track-list error) with matrix code letter 1D or higher. None were found 1A,1B or 1C, ( which are found on the commercial release). A lacquer includes Side 1 and Side 2. A limited number of lacquers/ stampers were used in pressing promos, Side 1 and Side 2 were drawn from different pairings, not symmetrical (not 1A/1A) nor sequential (not 1A/1B). There must be a mechanical reason why they are offset mirrored pairs (Side 1 stamper from one lacquer, side 2 stamper from another lacquer) and not symmetrical pairs (e.g.1E/1E), possibly to run two presses simultaneously, or to ensure metal sets from each lacquer wear equally, but that is for another day. Most auction copies have the corrected Side 2 label, and many claim theirs is an original first pressing, simply because it is a Six-Eye. One even declared it was the first pressing because the matrix suffix started with a 1 (simply original tape mix, like all). The label correction is believed to have taken place around November 1959, on the instruction of Teo Macero (hat tip Enrico!). It is not known how many labels with the side 2 error were printed, but the presence of the Side 2 error is proof of “early pressing” status 8/59 to 11/59. Columbia was a major, not the sort of small operator that would “use up” wrong labels to save money. In all likelihood they simply canned the misprinted label and replaced it with a fresh print-run, as Mr Macero requested. Or so Conventional Wisdom™ suggests. The tracklisting sequence error went uncorrected on the jacket for a further three decades, though some sellers confuse the label error and the cover error – suggest the error on the cover is somehow proof of original provenance. It exists! the holy grail 1A/1A. One of the few samples found where the matrix codes Side 1 and Side 2 are taken the same lacquer. The very few commercial mono copies were found with matrix codes in the range 1A to 1C on both sides ( five records only in the sample, they are very rare), all had the Side 2 track-list error. At 1D on both sides, Side 2 was found in both correct and incorrect track listing order i.e. lacquer letter progression rapidly stops being a useful guide to the very earliest pressings. Early letter-denominated mothers and stampers were used to press further copies with the corrected label for Side 2. Worse: later, rare combinations such as 1AC/1AA are found with and without the Side 2 error. Bummer. Someone using old pre-correction labels. The most frequently occurring matrix code on mono pressings is D, which was also used in manufacturing promos; after that, AC, AE, and AJ. . The highest value found was 1BD for Side 1 and 1BE (27th lacquer) for Side 2. Doesn’t mean there aren’t others higher, just not in my sample. There are clusters around certain letters, for example 1AJ on Side 1 is found with Side 2 as 1AD, 1AE,1AF and 1AG. There may have been 27 lacquers cut but many letters never appear, and only a limited number of lacquers appear to have been actually used for pressing. Evidenced by the Side 2 track-listing error, mono lacquers A, B, C and D (any on both sides) were used in the first pressing run, together with a small number of others: a minority of D1/D1 copies had the track list error, and one 1H/1D (1H lacquer used also for promo) was found with the error label, though there may be others. This was effectively the first identifiable pressing, running up to the August 1959 launch and during the first three months of sales. Seems a reasonable definition. Beyond that, you end up with any six-eye pressed between 1959 and 1963. Identifiable “early pressings” are very rare. The above examples of 1A 1B and 1C labels (note, always 1A as Side 2) each feature the two line bold album title. With 1D (different printer and pressing location?) the typesetting differs, a small point-size round font on one line There are a very large number of 1D/1D and 1J/1J – matching letter pairs found, which all have the same one line album title label style. The presence of an 1A or 1B on one side, and a higher value on the other, is not an early mono pressing, obviously. The majority of 1A and 1B matrix pairs are found as Side 2 paired with a higher letter on Side 1 (e.g. 1AL/1A, 1AK/1A and 1AC/1A, 1AC/1B 1AE/1B), all with corrected Side 2 listing. Metal from 1A and 1B lacquers was still being used some years later, mix and match. Why introduce a new lacquer 1AL when 1A is still capable of churning out acceptable quality pressings? The record industry says, conservatively, one master lacquer can generate at least five mothers of acceptable quality, each mother can generate at least five stampers, with each stamper capable of pressing around 4,000 albums. That is 100,000 albums per lacquer. I reckon sales of KoB was maybe ¼m between 1959 and 1963, pure guesswork. A,B and C could have manufactured the lot. Instead of three lacquers, over thirty were in use, out by a factor of ten. One of these assumptions is wrong by a factor of ten, crazy, but we find what we find. A known unknown. 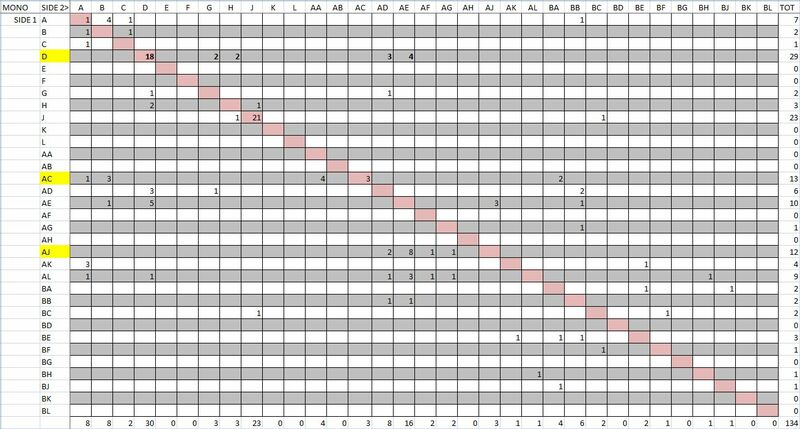 Though many different permutations eventually occur, almost half of all mono copies were pressed from only three laquers: D, J, and AE. A further five lacquers account for the next quarter of all mono copies: A, B, AC, AD, and AJ. In line with Conventional Wisdom™, first pressing on mono starts A, B, C, and (some) D, after which it is a veritable free for all, mix and not match. 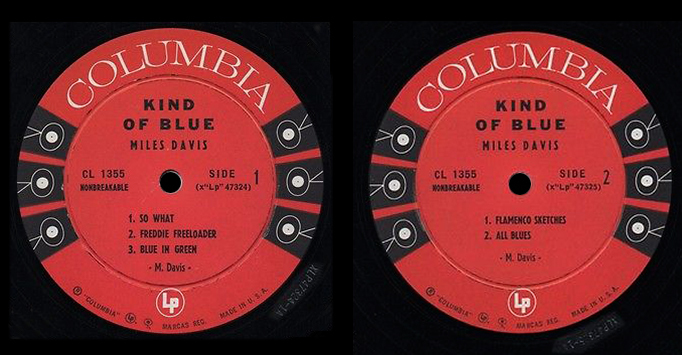 The mystery is the “missing lacquers” – the next letters which never appear on any side of any mono copy of Kind of Blue : E, F, K and L. None appear in the auctions sample or the reader survey. (For clarity, just in the case of Kind of Blue, not other Columbia titles). None ever appear at any later date up to modern times. Perhaps defective, or damaged, they were never put in service. Perhaps that is one reason why so many were cut: redundancy. Only one -1A/ -1B/ or -1C stereo six-eye was found, claimed as mythical “1B/1B” of which I am highly sceptical. I caught one seller claiming he had a 1A/1A in the auction headline which later in the description expanded to 1AC/1AE. (Yeah, they start with an “A”.) Another waxed lyrical over a 1A/1B six-eye stereo – RARE! ORIGINAL! FIRST! but failed to notice the CBS overprint and absence of deep groove. CBS overprint non-DG illustrated below (1962/3). I am not convinced the first stereo pressings followed the 1A/ 1B/ 1C/ route at all. The earliest pressing of stereo six eye is I believe stereo promos (E, K, AC, and AE), some other rare single alpha (1E and 1H) and some 1AA and 1AC which also have the Side 2 track-listing error – most of them do not. These identifiable early stereo pressings are pictured below. 1A stereo is only found paired with higher value letter (e.g. 1A/1AE) with the Side 2 track-list error corrected, so stereo lacquer 1A was used only in later pressings, not in any early stereo pressing run. In the case of Stereo, six lacquers account for half of all the copies manufactured, none of which are single alphabetic 1A to 1L. 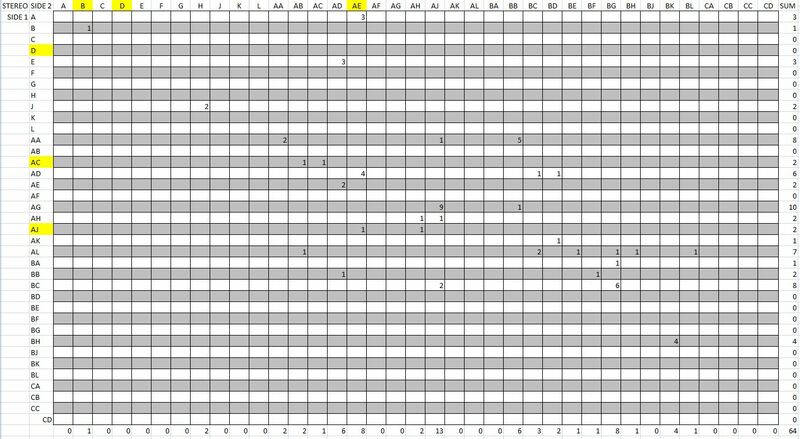 The most frequently found are in, order of magnitude, AJ, AD, BC, AA, AE and AG. Another fifteen lacquers contribute to the final tally of all those found. Mostly these are high values like BC/BG and BH/BJ , close to the CBS overprint and transition to two-eye label (1962/63) where lacquers from the third cohort 1CA to 1CL begin to appear. We now know where lacquer B went (or at least mothers derived from it) : Canada. Both mono and stereo six-eyes with a uniquely “Canadian” touch. Band 1. Band 2…so French. The suffix -1B is visible on mono Side 1 and seller described both sides 1B/1B. This could be a quite desirable source for early pressings. During 1963, the Columbia label changed from six eye to two-eye.Columbia two-eye KoB has a degree of chronology, so there are early and later two-eye. It follows more or less the overall Columbia evolution – Guaranteed High Fidelity becoming MONO (white print); and STEREO first in black print then white print. In a further variation the word “UNBREAKABLE” under the catalogue number disappears. Regarding the mono edition, it can be argued the lacquers used to generate promos are the genuine first pressing, then 1A,1B and 1C and a handful of 1D among the very earliest commercial release copies, evidenced by the presence of the Side 2 label track-listing error. These command a significant price premium at auction. With the Stereo edition, different principles seem to apply. Stereo promos, like mono, don’t follow any -1A -1B -1C pattern either; they are E, K, AC and AE. Then in the commercial release, 1E, 1H, 1AA and 1AC among the first pressings, evidenced by the Side 2 label track-listing error. Twenty seven lacquers of Kind of Blue were cut. Over the four years of the six-eye label, fresh pressing runs would draw on the stock of lacquers, a general chronological drift, but many “mismatched” stamper combinations. There may not be much significance the matrix code being an “early alpha” beyond mono A-B-C.
Is “earlier” better and “closer to the source”? For some records, possibly. Though lacquers were cut and numbered sequentially at the point of manufacture, for Kind of Blue at least, they were not drawn for use sequentially. They were distributed to various plants in an arbitrary pairs, it appears two laquers per plant, and those plants mixed Side 1 and Side 2 stampers derived from different laquers. There is no matrix-based code reason to believe a pressing off a 1BJ stamper will sound any different or better than one off an 1A stamper. No lacquer is a second or third generation copy, or a copy of a copy, or of later manufacture. Each lacquer is merely one cutting from the first master tape mix, all manufactured at the same time. They are all potentially the “first”. Ebay auctions of Kind of Blue on six-eye label over last three years where, seller identified matrix on both sides (198 commercial releases, 218 in total including twenty promos). Conventional Wisdom fails the Reality Test. 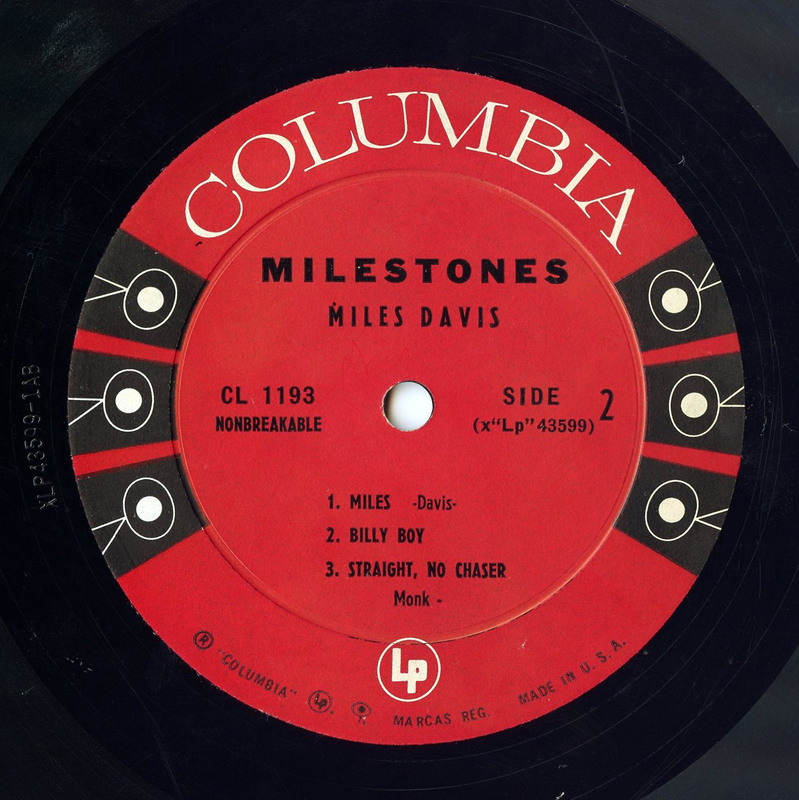 Milestones was manufactured through a similar process as Kind of Blue . However with very much fewer auctions, and fewer sellers still identified the stamper codes, little more likely to be learned in return for much greater effort.